Hi everyone!! I am super excited to be a new member of the Blockhead Part 2. I was selected by Betsy Chutchian. I recently got to know Betsy at Fall Market in Houston. Our booths were right next to each other and we had such a great time getting to know each other. She is such a talented designer and quilter and I couldn’t be more excited and honored to be in the same Moda family with her. Now onto business. 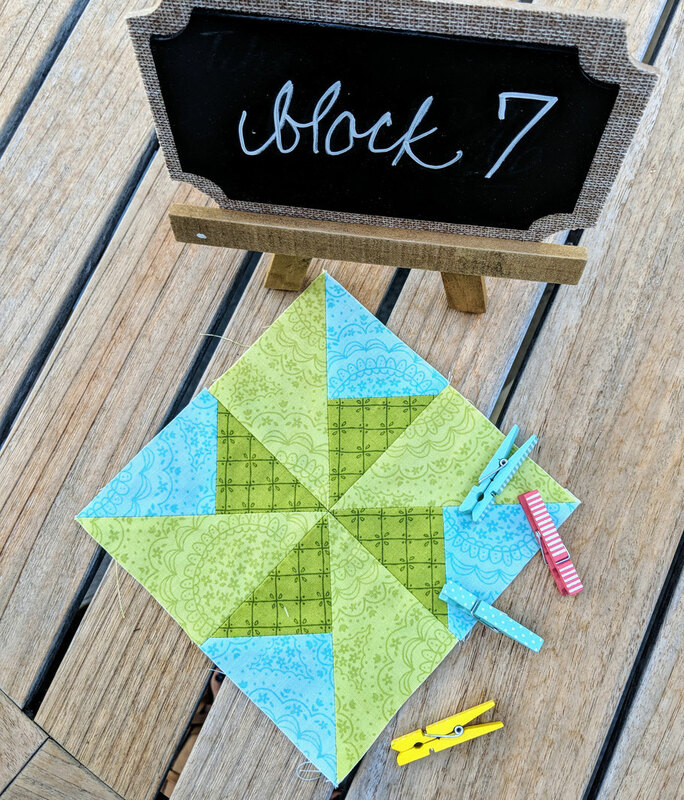 Today is my turn to introduce my first block for Blockheads Part 2. It’s called Spin cycle and it is the 7th block coming in at a whopping 6” finished. Although it is small, it is mighty! I love the implied movement of this block. I created it using fabric from my Home Sweet Home collection. You can download Spin Cycle http://blog.modafabrics.com/block-heads-2/ and click on Block 7 - Spin Cycle. It has been so much fun creating the blocks from the other designers. I think Spin Cycle is a great addition to all my blocks so far. Make sure to post your blocks Instagram and tag me @stacyiesthsu. I would love to see your version of Spin Cycle. Have a great day and say tuned for more great blocks from the other designers in the weeks to come! Cute, cute, cute.... now I might have to do another set in brighter colors. Unfortunately - no link to directions :( --that I can find. The website listed is not correct, even when I copied and pasted. I can't find the directions, no link and the link given says no page found. Whats up? Cannot get the directions. Please make it easier to obtain them. Thanks! Found 'em! I clicked on the words 'spin cycle 7' Who knew?? I love your bright and lively colors...Now I'll go look for the pattern. The directions were very recently placed on the moda fabrics site. Cut and paste the moda fabrics information from above. When you reach the site scroll down to the listing of all of the blocks. Block 7-Spin Cycle is the first one listed. Click on that and it will take you to the pdf for the directions. Hope this helps; I had been trying all morning. 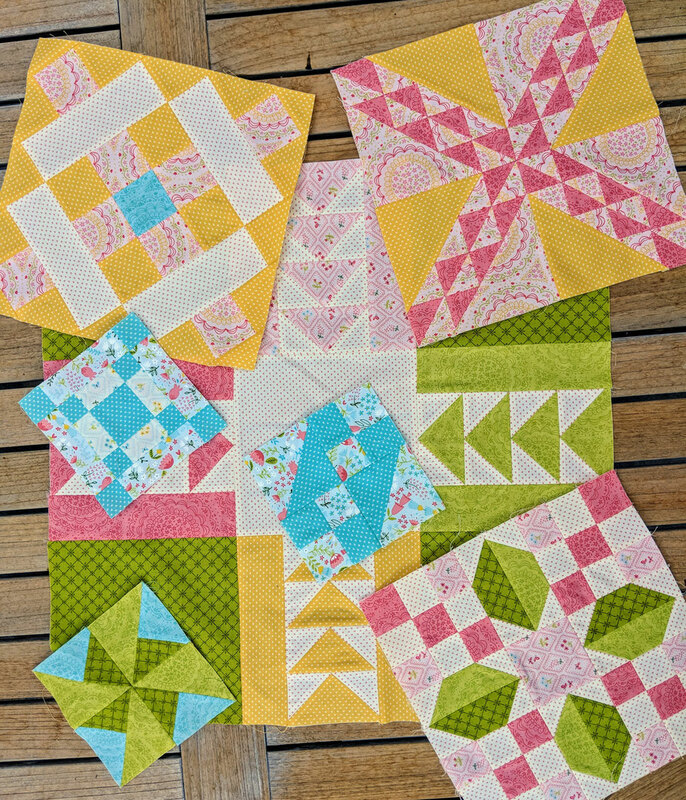 I love the block and the bright, cheery fabrics! I have finding the pattern, also. You can get the directions on the Moda website page where they have all of the weeks. It would have been nice to have a direct link. I LOVE your block pattern and can't wait to get sewing! Your block collection is delicious... such happy colours! It took some searching to find. Please help get the directions. Thanks. I can’t find the link. HELP! Cannot get directions. Tried web site etc. I find no instructions for this block. This happens a lot for me. you just can't find a link to click on. unable to find instructions or the block pattern. on this site or on the blog site referred to above. I waisted so much time clicking links from site to site. Tired of the run around. I’m done. I don’t care how great the quilt looks. I have better use of my time. I cannot get the pattern. Thank you Antoinette. Would never have found them without your directions. Folks - on the Moda site (using Stacey's link above), just beneath the illustration of the block, click on Block 7 - Spin Cycle. Phew! Had to work for our reward today LOL. There are two clickable links. One to her blog, one to the block 7 instructions. I too, can't get the instructions for block 7. Any help out there ? ---------> For those looking for directions to this block, look for the words "Block 7 - Spin Cycle" which are the last 4 words in the first paragraph and just before the second photo. Click on it and it will take you to the directions! I am really having fun with this set of blocks. I cannot find the bock pattern. I click on the links but it keeps taking me to this page without a download button. I am working a bit too hard to find this! Here you will find all pattern of Moda Blockhead 2018. Click on each pattern für PDF . when you click on the link for the block 46 pattern all you getv id ads for fabric and a little purse.